I don’t have any biological children of my own. However, I’m dating a woman who has eleven-year-old fraternal twins. The boy is just like he’s always been: freewheeling, fun, respectful, smart. The daughter, now just 14 months away from “official” teenagedom, is another story completely. She’s still incredibly smart and gets straight-A’s, but there are many more sighs, many more squabbles, and desire for more independence. “Decoding Your 21st Century Daughter” contains all matter of information that will help my girlfriend deal with “Princess” as she goes through the turbulent years ahead. Author Helen Wright’s credentials are impeccable when it comes to teenaged girls. She was Head of two of the UK’s best schools–winning the national “Best School Head of the Year” Award–and has now moved her expertise and experience to a top school in Australia. Best of all, she has produced this small, potentially sanity-preserving volume that will be a lifesaver for parents everywhere. There are countless parenting books that are dauntingly long, or bogged down with dry, clinical prose or footnoted statistics. Helen Wright’s book guides parents through all manner of 21st Century issues your teen will face:from rampant media and Internet sexuality to her own sexual maturation; from helping your daughter get the right education, to learning to trust her with her friends. Best of all, Dr. Wright includes reassurance for parents: you are going to make mistakes. There’s no way around it. It will be okay. She also touches on issues like smoking, drugs, and drinking, and how to react if your teen comes home from a party where she imbibed. The overall tone of the book is reassuring, tempered with caution. We learn that teen-aged girls’ brains really ARE wired differently than our grown-up minds, and that this wiring–combined with them being raging balls of hormones–explains the biological reasons why teenaged girls are so difficult at times. This has been going on since cave-teens, and the tradition is explained. As I mentioned above, there are so many new threats today. Take body image alone. She quotes a study that found teenaged girls today encounter more images extolling physical perfection in one day than their grandmothers did during their entire life. This can lead to bulimia, anorexia, depression, anxiety–any number of issues. Dr. Wright explains how to seek help if your daughter, God forbid, encounters one of these maladies. 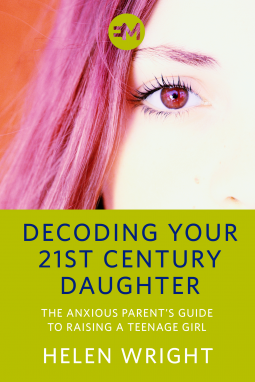 The biggest bonus to “Decoding Your 21st Century Daughter” is that Dr. Wright’s advice is presented in clear, easy-to-read, concise chapters, just perfect when you have to look up a situation you’re facing with your once-little girl. Raising a teenager is never easy, and girls present some special issues of their own. “Decoding Your 21st Century Teen” won’t get rid of all the bumps, but it will help your journey be as smooth as possible.